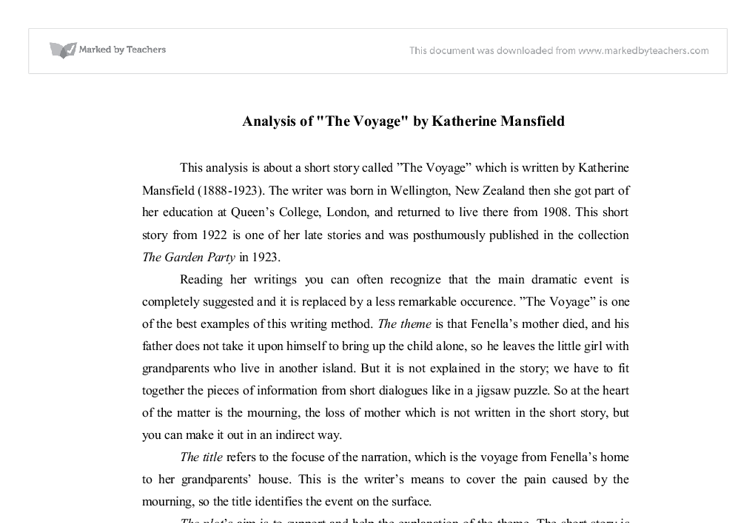 Analysis of "The Voyage" by Katherine Mansfield This analysis is about a short story called "The Voyage" which is written by Katherine Mansfield (1888-1923). The writer was born in Wellington, New Zealand then she got part of her education at Queen's College, London, and returned to live there from 1908. This short story from 1922 is one of her late stories and was posthumously published in the collection The Garden Party in 1923. Reading her writings you can often recognize that the main dramatic event is completely suggested and it is replaced by a less remarkable occurence. "The Voyage" is one of the best examples of this writing method. The theme is that Fenella's mother died, and his father does not take it upon himself to bring up the child alone, so he leaves the little girl with grandparents who live in another island. But it is not explained in the story; we have to fit together the pieces of information from short dialogues like in a jigsaw puzzle. So at the heart of the matter is the mourning, the loss of mother which is not written in the short story, but you can make it out in an indirect way. ...read more. Was it going to change?". The answer is yes. The boat docks and they get on the cart: "the hooves of the little horse drummed over the wooden piles, then sank softly into the sandy road". The transition finishes and the new life starts: arriving at her grandparents home Fenella looks at "Grandma's delicate white picotees", which refer to a shiny and cheerful life. Entering the house she mets a white cat and buries her "cold little hand in the white, warm white fur", and smiles "timidly", and Grandpa is still warmly in bed, with only "his head with a white tuft" showing. Symbolically, these images may signify that a difficult period in Fenella's life is now behind her, now she has arrived in a new, stable home. It is evident that the main character in the short story is the little girl, Fenella. She is about 6-8 years old, and the reader can follow during the story what she sees, hears, or thinks. The story is narrated in the third person singular by a narrator who is not a character but through the eyes of Fenella. As she is so young nobody tells her what is going on, but she feels that something unpleasant will happen. ...read more. That is a funny event when Grandma insists on taking the upper berth, surely to save the little girl from falling down. But you also know that she does not usually give herself a cabin so she does not know how to get up there. The old lady also is the person who helps you to clear up the mistery: who has died. In her first speach with the stewardess you only know that Fenella and Mrs Craine wears mourning because 'it was God's will'. The short story takes nine pages in our book and the writer brings it to light only on the seventh page that Fenella's mother is the dead by this sentence: 'poor little motherless mite'. This kind of mistery dominates the short story. At the beginning of the narration there is nothing you could know about the three people: you do not know why they say goodbye or where they go to or what happened in the past. But according to little scraps of conversations, looking at the characters' faces, following the descriptions of Fenella, 'meditating' on the words she uses and impressions she has, the 'white mist' rises a bit. It is wondering that Katherine Mansfields was able to write about ordinary events filled with unspoken dramas without writing down feelings or the main message. ...read more. I shouted at him "Say that again and your locked up" replied the man, now glaring fiercely at me "This is not your land; this is not your land! The forest is natures land and your construction is killing it!" Old Major waited till the animals were all present and silent. This also alludes to the importance of the topic he was going to talk about since it was his intention for all the animals to know about it and to give it their ultimate commitment. "You may return the textbook", "...LIBRETTO". Paul curious about Keller, is given the 'textbook' which was paper cuttings from the past and current, Keller lets him borrow the book, as he wants Paul to see the true side of human life, which include human flaw, and greed for money and power. The director has done this, I feel, to add to the child's insecurities - making the boy feel like he is on his own. The director also conveys the child's insecurities by using a long shot - showing the boy's whole posture. Nobody living that is. He poured his heart out, not a single hesitation or stutter. At the end of his speech, tears were falling down his face as snow falls down to the ground. He cried himself to sleep letting the fog envelop him in a hug. It nose dived toward the snow. Inside, Taylor and Rachel reached a metal door. Taylor typed in a pass code and it opened revealing a cramped metal tube, "Get in! It will keep up safe!" They dived in and the door closed. Captain Geoffrey Turner rubbed his forehead as a warm, crimson liquid trickled down his cheeks. The killer must be local; all the murders have been between Moniave and Stranraer. Joanne's body had drifted up from the bottom of the lake, I could tell by the seaweed on her. This was not a recent murder, but an older one, from before I knew about this case. DAN BROWN Here. Take me to Chateau Villete! The cabbie's mirror is suddenly shot by Silas. He gets out of the car. CABBIE It's all yours! The cabbie runs and Dan hops into the driver's seat of the car. He drives away.